Fire trucks arriving at Chotana Bazaar Market which erupted in flames on January 23, 2016. Vendors at the popular Chotana Bazaar Market suffered a serious blow when a fire broke out at 10.40 p.m. on January 23, 2016. The market, which is located on Chotana Road near the Mercure Hotel had over over 23 shops seriously damaged in the blaze. Police and firefighters arrived on the scene with 10 fire trucks to find over 40 commercial buildings blazing with flames. All the shops contained clothing, hats, bags and other flammable items. Firefighters took over one hour to control and stop the fire. Over 23 shops were heavily damaged. 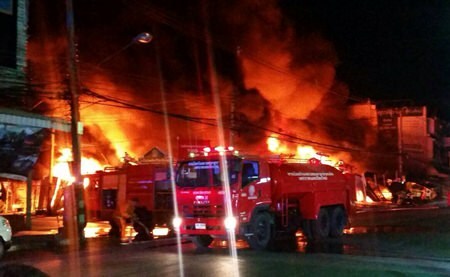 Damages caused by the fire estimated to cost over 10 million baht. Pending further investigations, firefighters believe that a short circuit may have started the fire. Shop owner, 61-year-old Ms. Juangtip Pasuwat, said that she was already closing up when she saw thick smoke coming out of her building. Within minutes, the flames had spread and her neighbors were unable to stop the fire. Firefighters believe that a short circuit may have started the fire. Further investigations will be conducted to trace the actual cause. 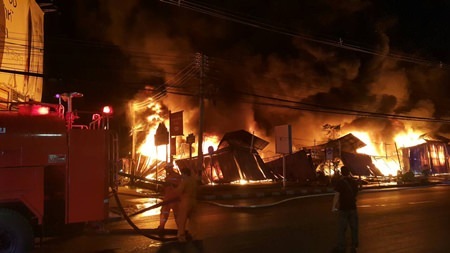 The owner estimated that over 10 million baht worth of items and facilities has been destroyed. 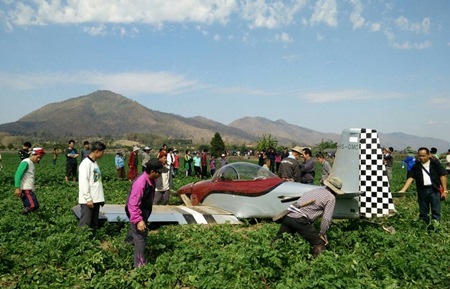 A private plane piloted by a Canadian man makes emergency landing in a Phrao tapioca field after developing engine trouble. 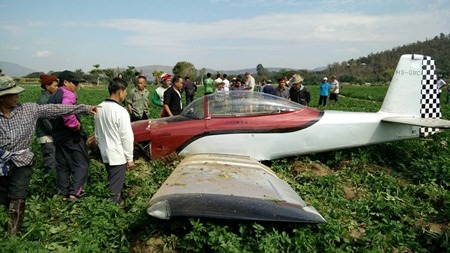 Phrao villagers called the police after seeing a light plane land in a tapioca field in Baan Luang on January 24, 2016 at 10:30 a.m. Long Khod Police in Phrao rushed to the scene to find a privately owned red-grey Van’s RV-8 (registration HS-GMC) had made an emergency landing in the field after experiencing engine failure. The owner of the tapioca field talks about the plane landing in his field and calling the police to come help the pilot and passenger. The pilot, 55-year-old Canadian, Mr. Gary McNair, a former pilot for Korean Airlines, and his passenger, 56-year-old Mr. Martin Clarke, also Canadian, were slightly injured but safe. There was minor damage to the tapioca field, which belonged to Mr. Supit Mahawan and Mr. Prapin Hankla. 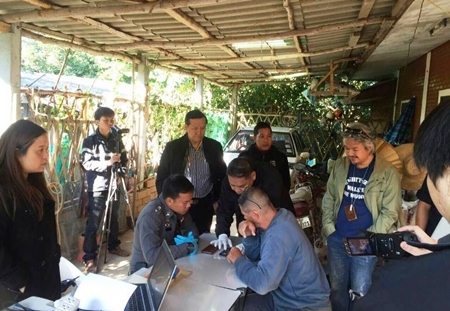 Mr. Kiethisak Rienwattana, Director of the Air Traffic Control Centre in Chiang Mai, said the pilot had requested permission at 9.10 a.m. to fly from Nok Airport in Baanthi, Lamphun, to Amphur Chiang Dao. On the way back, the plane experienced engine trouble at 9.55 a.m. and needed to land as soon as possible. The Van’s RV-8 is a small plane popular among foreigners in Thailand. Many of these privately-owned planes are parked at the Nok Airport hangar. CEO Somchai Lertsutiwong andAIS staff at the ‘4G Advanced’ service launch and 4G New World New Experience’ fair held on 26 January 26, 2016. On January 26, 2016, Advance Wireless Network Co., Ltd. (AWN), a subsidiary of the Advance Info Services PLC (AIS) Group, announced the official launch of 4G service in 42 provinces in regions nationwide. 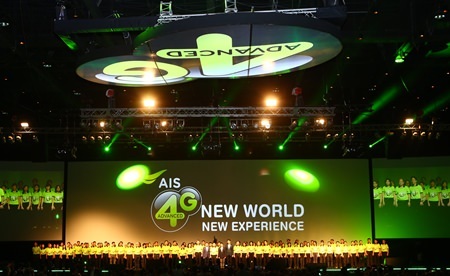 The ‘AIS 4G Advanced’ service comprises full-speed packages, a range of 4G service centers and other packages such as ‘multiple internet devices’ and ‘family internet fee sharing’ in accordance with the company’s support for the growth of Thailand’s digital economy. Along with ‘AIS Play’, an entertainment application center that comes with 100 TV channels, the company target is to have full 4G coverage in every province by May 2016. According to Somchai Lertsutiwong, Chief Executive Officer, the company is “the first and only service provider to offer services in both 1800 MHz and 2100 MHz”. The services will be launched under the slogan, “AIS 4G ADVANCED 4G, the fastest 4G ever”. ‘AIS Play’ will be offered to customers who subscribe to the company’s 4G packages allowing them to watch movies “embedded with 100 GB of AIS Cloud for free for the entire year”. To celebrate the launch of the new service, the company hosted the ‘AIS 4G New World New Experience’, a mega fair on 26 January for customers to experience this new mobile communications standard, the 4G Long-Term Evolution (LTE) technology and understand its benefits for small and medium-sized enterprises (SMEs) with online businesses, start-ups, and content service providers. AIS also unveiled the new large screen 18.4-inch full high definition (HD) Samsung Galaxy View entertainment tablets at the fair. 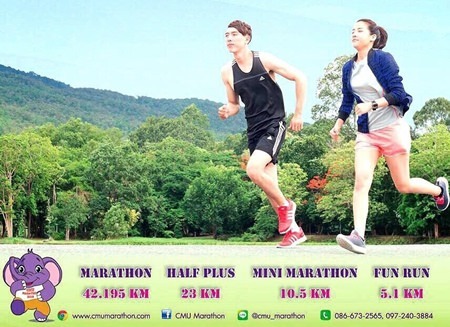 Chiang Mai University (CMU) will host the Winter Love Run Marathon 2016 on Valentine’s Day. The Faculty of Engineering, in conjunction with the Faculty of Engineering Chiang Mai University Alumni Center, has recently scheduled the charity run for February 14 this year. Winners will receive the prestigious Royal Trophy among other prizes. Chiang Mai University Marathon 2016 medals to be awarded to participants of its Winter Love Run Valentine’s Day event. There are 15 different prizes to be won in the race, which will start and finish at Ang Kaew Hall on the CMU campus. Funds raised by the event will be used to support the needy patients in Maharaj Nakorn Chiang Mai Hospital and for the development of the Engineering Faculty. The race consists of 4 different categories. The full Marathon (42.195 kilometers) will start at 3 a.m. while the Half Marathon (23 kilometers) will flag off at 5 a.m. The Mini Marathon (10.5 kilometers) will begin at 6 a.m. nd the 5.1-kilometer Fun Run will start at 6.30 a.m. All categories are open to both males and females, and there are no age limits. The first to fifth-placed winners in each category will take home the Royal Trophy as well as a Chiang Mai University Marathon 2016 medal. First to third-placed winners in each category will also receive cash prizes of 3,000 baht, 2,000 baht and 1,000 baht respectively. The organizers recently announced that over 2,500 people have now registered for the event. The Fun Run category has already received 670 entries and registrations will be closed when the number reaches 800. From left Bringkop “Joe” Vora-urai, conductor of the Lanna Orchestra, TIBF organizer Sornchat Krainara of All About Arts Thailand, Jaruwan Suwannasat, Director of the Exhibition and Events Department of the Thailand Convention & Exhibition Bureau, Wisoot Buachu, Director of the TAT Chiang Mai, Warunee Khammeru, Representative of the Northern Thai Hotels Association and Executive Assistant Manager of the Duangtawan Hotel, and puppeteer Pairat Sawasdisara. 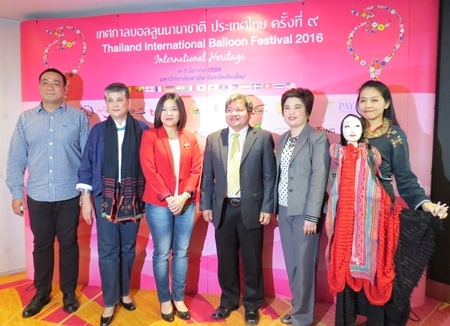 The Thailand International Balloon Festival held a press conference at the Dusit D2 Hotel on Tuesday, January 19, 2016 to announce the upcoming event which will be held on March 4 and 5 at Payap University. Exciting new features such as the International Heritage section, performances and original composition for the Night Glow Balloon show were introduced as well as the many delicious food booths hosted by the top hotels in Chiang Mai. This year the festival is being held at the beginning of March to give everyone a better opportunity to visit the fair. Payap University is a great location for the event with easy access and plenty of parking for visitors. The organizers are looking forward to promoting Chiang Mai in March when there aren’t as many events filling up the calendar and offering tourists yet another great reason to visit this beautiful city in Northern Thailand. A special feature of the Thailand International Balloon Festival this year will be Chiang Mai’s diverse international community in the International Heritage section with booths from India, France, Switzerland, Sweden, Spain, Germany and many other countries featuring performances, special activities, food and more. The focus on the cosmopolitan and international nature of Chiang Mai continues with night time concerts from popular and talented locally based international musicians. Chiang Mai is a hugely popular destination for expats in Thailand due to its arts and music, diverse culture, great climate, beautiful nature, friendly people and modern lifestyle. This is reflected in the diversity of musicians and artists taking part in the event. Payap University will offer the ideal location for balloon shows, performances and the spectacular balloon night glow show which will feature original compositions by Ajarn Bringkop “Joe” Vora-urai and the Lanna Orchestra. This amazing performance will be the first of its kind in the world and Ajarn Bringkop promises an inspiring and moving performance set to the beautiful sight of glowing balloons in the night sky. He said that he wants to convey not only the movements of the balloon but also the emotions of the pilots as they fly their balloons. This unique festival will draw members of the diverse international community of Chiang Mai and the North of Thailand as well as pilots and balloons from around the world. One of the highlights of the event calendar in Chiang Mai, this event proves to be a huge hit year after year. Jaruwan Suwannasat, Director of the Exhibition and Events Department of the Thailand Convention & Exhibition Bureau said that the organization is a big supporter of events of this nature in Thailand and believes that Thailand offers many advantages including long history and venues around the country. The launch of the ASEAN Economic Community makes Thailand ideal to become the hub for mega-events in Asia. The TCEB works under the supervision of the Prime Minister’s Office to develop and expand business events and ensue that we are one of the destinations for business events in Asia. The Tourism Authority of Thailand is a proud sponsor of the event with TAT Chiang Mai Director Wisoot Buachum noting the long history of the event being held in Chiang Mai. This year is being held in March to promote tourism in Chiang Mai and draw tourists to the city in a period when there aren’t many festivals and events. As part of the Thailand International Balloon Festival’s commitment to community they are proudly hosting the Chiang Mai International Rotary Club’s annual Golf Ball Drop in which tickets are sold for ball numbers and on March 5 at 5 pm golf balls will be dropped out of the balloon and the numbered ball closest to the target wins 30,000 baht! Tickets are three for 1,000 baht or one for 500. The Chiang Mai International Rotary Club is closely involved in working with the local community with programs to prevent drowning in young children, winter clothing distribution, clean water for schools and eyesight clinics for children among the many projects they have worked on or are still working on. Interested parties can contact cmirotary.org for more information on the Golf Ball Drop. Tickets will cost 200 baht for adults and 50 baht for children and will be available at Rimping Supermarkets around Chiang Mai including Maya Lifestyle Mall, Promenada Resort Mall, Nim City Daily, Nawarat and Meechoke in Chiang Mai. Tickets will also be available at the door. Thailand International Balloon Festival 2016 is organized by All About Arts with sponsorship from the Thailand Convention & Exhibition Bureau, TAT, Chiang Mai Municipality, Tiger Balm and local hotels. Consul General of Japan Shinya Aoki and the Director of Uttaradit Hospital Songwut Subthawisin examine the equipment purchased with funds donated by the Japanese government. The Government of Japan, under its Grant Assistance for Grassroots Human Security Projects Scheme (GGP), has provided funds amounting to 2,738,000 baht for “the Project for Procuring Medical Equipment for Patients with Chronic Respiratory Disease in Uttaradit Province”. 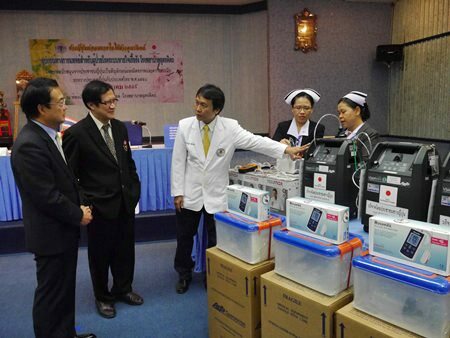 On 18 January 2016, Mr. Shinya Aoki, Consul-General of Japan in Chiang Mai, and Mr. Songwut Subthawisin, Director of the Uttaradit Hospital, were present at the hand-over ceremony of oxygen concentrators and related medical devices at the Uttaradit Hospital. Uttaradit Province lies about 500 km north of Bangkok and about 250 km South of Chiang Mai. The population of the province is about 460,000 people and most are engaged in agriculture. Uttaradit Hospital is a public hospital in Uttaradit Province under the jurisdiction of the Ministry of Public Health. The hospital functions as the medical center of the province receiving and treating serious cases sent from the district level hospitals. Most of the in-patients in the hospital have insufficient funds to pay the costs of long-term hospitalization, so the Department of Internal Medicine has established a home medical care system. Procuring oxygen concentrators for this project thus makes a contribution to improving the quality of life and psychological welfare of the patients by eliminating the cost and extra work of replenishing oxygen tanks. It is expected that this support will contribute to ensuring the improvement of the home medical care system provided by the hospital. The Japanese government intends to continue supporting projects which contribute to improving medical and healthcare services through its Grant Assistance for Human Security Projects scheme (GGP). Chiang Mai is ready for the 40th annual Chiang Mai Flower Festival which will be held from February 5 – 7, 2016 at Suan Buak Haad Public Park, Tha Pae Gate and the Three Kings Monument. The Flower Festival will have flower and plant contests, plant sales, and of course the Miss Flower Festival beauty pageant as well as the Miss International Flower Festival to be crowned. There will also be music concerts in the park and the OTOP market as well as many food stalls. 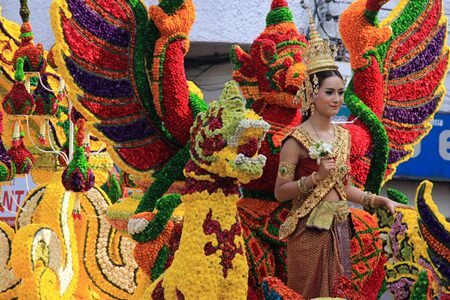 Chiang Mai will be decorated with flowers as the city celebrates the 720 year anniversary of the founding of Chiang Mai. 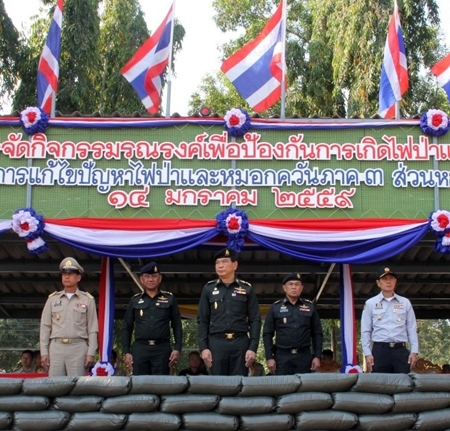 The opening ceremony on February 5, 2016 while the parade will be held on February 6, starting from Nawarat Bridge to Tha Pae Gate and on to Suan Buak Haad Park. Many streets in the area will be closed for the parade. 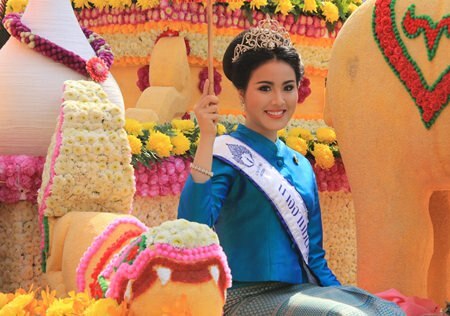 The parade features floats decorated with plants and flowers from districts from across the province and the floats will be parked at Suan Buak Haad for the weekend so that visitors can take their photos. The inner moat roads Arak and Bumrung Buri will be closed at the Suan Buak Haad corner for the festival. Chief of Chiang Mai Police Pol. Maj. Gen. Montri Sumbunnanont with the arrested suspects and the packets of Yaba they had allegedly tried to smuggle into Muang Chiang Mai. 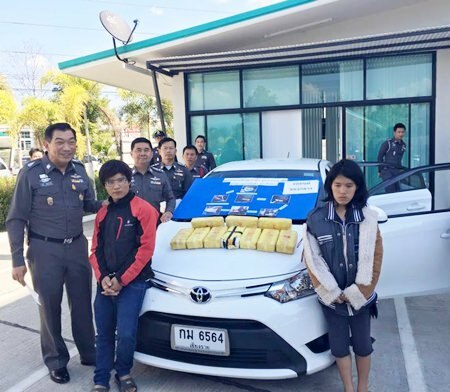 A young couple was arrested after police discovered 100,000 methamphetamine tablets hidden in their car at a police checkpoint on January 14, 2016 in Chiang Dao District. Chief of Chiang Mai Police Pol. Maj. Gen. Montri Sumbunnanont announced the arrest 28 year old Winai Chumueku from Chiang Dao and his girlfriend Natrika Suemue age 28 from Chiang Rai with 100,000 methamphetamine tablets. 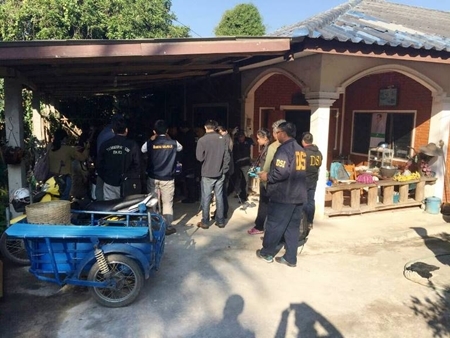 Police said that the arrested drug traffickers were ordered to stop at a checkpoint in Baan Kaeng Pan Tao in Chiang Dao, Chiang Mai at 11:30 p.m. on January 14, 2016. A search of the Toyota Vios found 40 packages of Yaba hidden under the driver’s seat. The accused confessed that they had problems with money and so had agreed to carry methamphetamine to the city. They hired a rental car in Muang Chiang Mai before driving up North to pick up the drugs. They confessed that this was the second time they had smuggled drugs, the first time they had brought in 700,000 Yaba tablets. Police will continue investigation into the case to uncover the drug trafficking network involved in the case. Third Army Commander Lt. Gen. Somsak Nilbancherdkul launches the new 3rd Army Kick Off Campaign to combat forest fires and haze on Thursday, January 14, 2016. As part of the government’s bid to educate people about forest fires and haze in the North, the 3rd Army launched a campaign on January 14, 2016 at the Armed Forces Development Battalion in Mae Rim. The launch of the Kick Off Campaign to Prevent Forest Fires and Haze 2016 was presided over by Lt. Gen. Somsak Nilbancherdkul, 3rd Army Commander who said that forest fires in the North are mainly caused by human activity and end up out of control, causing serious haze in the region. The fires are a problem from people burning the forests for food from January to March with major effects on public health, damage to the environment and causing problems with air transportation. He called on all sectors to work together to combat the annual haze that chokes Northern Thailand. Over 2,500 government officials joined the campaign and learned about methods to use instead of burning, the tools and equipment used in firefighting and to provide education guides on how to create awareness and understanding in the general public. CHIANG MAI,(NNT) – The northern province of Chiang Mai is gearing up to host the Lanna Expo 2016 in June and July, hoping to boost local entrepreneurs’ competitiveness following the opening of the ASEAN Economic Community. Chiang Mai Governor Pawin Chamniprasart convened a meeting with relevant officials at the provincial city hall to follow up on the progress of preparations being made for the Lanna Expo. To be held for the fourth time this year, the event is scheduled for June 30 through July 6 at the Chiang Mai International Exhibition and Convention Center. The expo will offer visitors various types of products and services, including tourism products, industrial crafts and health services. There will also be exhibitions showcasing the potential of entrepreneurs in the Upper Northern Provincial Cluster in various aspects, along with academic seminars. The attendants at the meeting expected the Lanna Expo to help enhance local operators’ capabilities and give them a competitive edge against others in the ASEAN Community era. More discussions will be arranged concerning other details of the expo, such as zoning and the tackling of problems compiled from previous events. His Majesty the King has extended his wishes for all Thais to meet happiness, progress and success in their goals. In his New Year message released on New Year’s Eve, His Majesty said happiness and misery as well as fulfillment and disappointments were normal happenings nobody could avoid. He, therefore, urged all Thais to prepare their mind and body for such an event by not living in complacency. In the royal message, His Majesty urged that in the new year Thais enhance their physical health and keep their mind awakened in order to be able to go through undesirable situations and achieve the goals of happiness, prosperity and success. 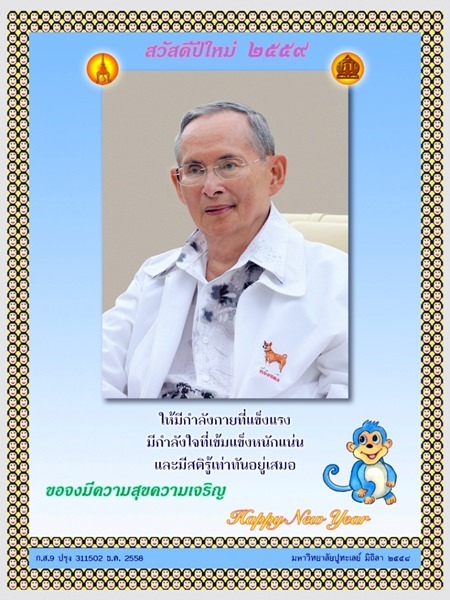 His Majesty the King also designed a New Year greetings card for his subjects. The royal greetings card depicts His Majesty wearing a white lightly-patterned Hawaiian shirt under a white light-jacket which has an embroidered Khun Thongdaeng royal pet logo on the left breast. Under HM the King’s photo are a few lines of blessing in Thai, read as “May all have strong physical health, stable spirit and mind and always be mindful to keep abreast of situations”. Above the picture says “Happy New Year B.E. 2559”, and on each corner lie the Great Crown of Victory and the golden urn. Under HM the King’s picture to the right is a cartoon of blue monkey representing the Year of the Monkey. To the left reads “May you have happiness and prosperity”. 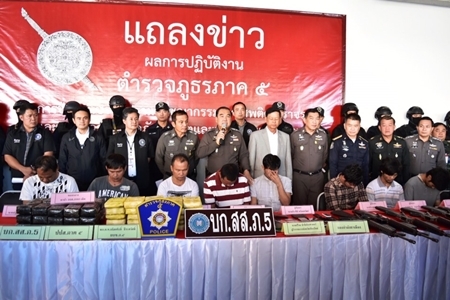 Royal Thai Police Region 5 announce the arrest of 9 drug traffickers in Pathum Thani on Monday, January 7, 2016. At 10.30am on January 7, 2016, Pol. Maj. Gen.Tanisak Teerasawat, Commander of the Royal Thai Police Region 5, Wichai Chaimomkol, Director of the Office of the Narcotics Control Board (ONCB) Region 5, and Pha Mung Task Force officers announced the arrest of 9 drug traffickers in Pathum Thani and one in Paton sub district, Muang Chiang Mai. Prateep Soisub, 43, Somsak Poonpol, 39, Nattakorn Nontsomboon, 40, Somporn Watchang, 45, Sangwan Sasanae, 41, Sudkate Suriyawattananont, 25, were arrested along with Teerayuth Kumwong, 30, Saran Boonrua, 25 and Boonyarit Songcharoen, 30. 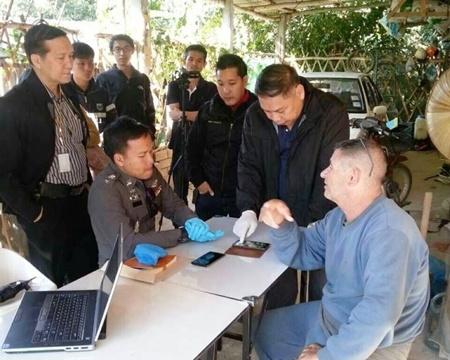 They had drugs, guns and weapons in their possession including five M-16s and five AK-47s as well as three cars, 13 mobile phones, four credit cards and 23,000 baht cash. Investigations indicated that there would be a delivery on January 3, 2016 at a lane near Bliss Resort on the Chiang Mai-Lampang Rd along the Super Highway in Paton sub-district. Phumpipat Intarapradit, 41 from Fang, was arrested upon arrival at the drop off point. He told the police that the 398,000 methamphetamine pills and 3 kilograms of crystal ice found in the car were from Fang District along the border and were for distribution to a drug network. The accused helped the investigators by arranging delivery the next day on January 4 at the PTT gas station near the entrance to the golf course in Klong Luang in Pathum Thani. The second group brought weapons in exchange for the drugs. All were promptly arrested. Police said this is the first time they had seen weapons exchanged for drugs. Thirteen Malaysian tourists and a Thai tour guide were killed when their Chiang Mai-bound bus plunged into a ravine in Doi Saket District. Police believe the accident happened after the Weerapan Tour coach driver hit another vehicle then sped away from the scene and lost control on the Pang Fan curve of Highway 118. Driver Somporn Bualuang, 58, was being held in police custody at Doi Saket Hospital. On board the bus were 21 Chinese-Malay tourists on their way back to Chiang Mai from visiting tourist attractions in Chiang Rai. Eleven were pronounced dead at the scene and three more at Doi Saket Hospital. Malaysian media reported they came to Chiang Mai on Dec. 17 for a five-day tour organized by Malaysian tour operator Chiu Travel. Killed were four of six members of one family, spanning three generations, from an 85-year-old grandmother to her 39-year-old granddaughter, according to Malaysian media. Before the accident, Somporn collided with another vehicle, pushing it off the road and crashing into a post. The driver was unhurt, but instead of stopping, Somporn accelerated, trying to escape the scene. He lost control of the speeding coach when it hit the treacherous curve about 30 kilometers from Chiang Mai. Chiang Mai Governor Pavin Chamniprasart rushed to the scene. He said state insurance would pay up to 1.6 million baht for each fatality and 850,000 for those injured.